Born as a rifle factory in 1689, Husqvarna began the production of powerful outdoor equipment designed for the garden care in 1947, when it tested its first engine-powered lawn mower. Since then, the manufacturer extended its range of lawn care tools and today it manufactures a wide variety of garden care equipment, including a selection of weed eaters intended for both residential and commercial use. Maintaining the high-quality of its products over the years, there is no doubt that Husqvarna is one of the preferred brands when it comes to choosing reliable weed eaters. For this reason, I made a selection of the most popular tools and created this list of Husqvarna weed eater reviews that should help you choose the right tool. Homeowner: a range of weed eaters designed for seasonal or occasional use. In this category are included both battery-powered and gas-powered tools of the medium-duty category. Landowner: the weed eaters in this category are heavy-duty tools designed for occasional or frequent use. These weed eaters are more powerful compared to those from the homeowner category and are generally gas-powered. Professional: in this category, you will be able to find a series of heavy-duty weed eaters designed for frequent and intense use, dedicated to the landscapers and lawn care professionals. These are the most powerful weed eaters manufactured by Husqvarna, are extremely performant but also more expensive compared to the weed eaters from the other two categories. Regardless the use destination, when choosing a Husqvarna weed eater you will basically have to choose between a gas-powered and a battery-powered tool. Let’s see the main characteristics of each of these categories. In addition to powerful and reliable engines that varies in power from 21.7cc to 34.6cc depending on the use destination, most of the Husqvarna gas-powered weed eaters have a few features in common that are designed to make these tools as user-friendly as possible. Smart Start System: this unique Husqvarna function is one of the greatest innovations regarding the starting of a gas-powered garden care tool. This system actions on both the engine and the starter to enable a quick and effortless start of the weed eaters. In addition, the tools are also equipped with an auto-return switch that automatically returns the switch to the start position when you turn off the machine. Thanks to this innovative system, you will be able to easily start the weed eater at any time. Intuitive controls: to improve the ease of use of its weed eaters, Husqvarna also equipped most of the gas-powered tools with intuitive controls that are easy to understand and easy to reach. Functions such as choke and purge can be easily enhanced. X-Torq Engine: some of the weed eaters in both residential and commercial categorie﻿﻿s are equipped with these advanced engines that are designed to reduce the emission of toxic fumes with 60% and to increase the fuel efficiency with up to 20%. Easy to maneuver: a thing I really like about Husqvarna’s weed eaters is their excellent balance. In addition, all of their tools are fairly lightweight and equipped with soft-grip handles, having a great maneuverability. Mainly designed for residential use, the battery powered weed eaters from Husqvarna are well-balanced, powerful and lightweight, featuring high-quality motors. These weed eaters are suitable for most types of grass and weeds, but there are a few characteristics that make these tools even more special. Emission-free engines: although small in dimensions, the Husqvarna brushless engines are powerful enough to deliver full torque, being efficient and reliable. In addition, you will be able to forget about the maintenance procedures and operate a 100% environmentally-friendly tool. Comfortable to use: the cordless Husqvarna weed eaters boast ergonomic designs, while the battery-powered engine produces fewer vibrations compared to the gas-powered models. These tools are also quieter, improving the overall user experience. All these features, in combination with the perfect balance, make the battery powered weed eaters very comfortable to use. Interactive Keypad: the cordless weed eaters from Husqvarna are really easy to start and stop thanks to the integrated interactive keypad. In addition, from the keypad, you can also control the power and runtime thanks to the convenient SavE function. This function allows you to increase the runtime by reducing the power. Cooling system: to maintain the lifespan of the batteries, the tools are equipped with a convenient cooling system that allows you to work for a long time even when the temperature is high. Long running time: all the cordless electric weed eaters are powered by 36-volt lithium-ion batteries that ensure about the same run time as a full gas tank. The batteries recharge in less than an hour, so if you want to use the weed eater on large lawns, you could invest in a second battery. Interchangeable batteries: the batteries used to power the cordless electric weed eaters are part of the Husqvarna Battery Series and are compatible with all the other tools in the system, including hedge trimmers, blowers, and other useful lawn care tools. Another category of Husqvarna weed eaters that is worth mentioning is the series of tools manufactured for versatile use. For the weed eaters in this category are available a series of attachments that allow you to transform the weed eater into an edger, hedge trimmer, sweeper, pole saw, cultivator, blower and more. Based on this information, you should be able to decide if you want to invest in a gas-powered or battery powered tool. Now, read the Husqvarna weed eater reviews to decide which tool to buy. Included in the versatile use weed eaters category, the 128LD is one of the most popular Husqvarna weed eaters available on the market. This tool is powered by a 28cc 2-stroke engine that features the above mentioned Smart Start technology. Being a versatile multi-use tool, the 128LD boasts a detachable straight shaft. The weed eater comes with a 2-year limited warranty that, in the case you register the product on the official website, is extended to four years. 11 attachments: this versatile tool boasts eleven different attachments that can transform the tool into a powerful edger, blower, cultivator and more. 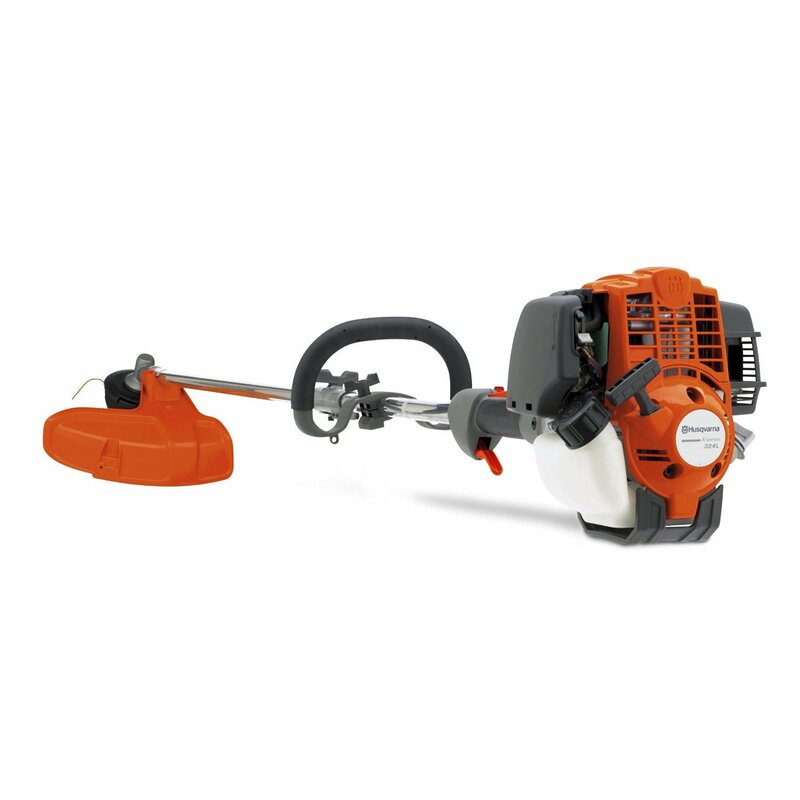 Trimmer blades available: although this is a string weed eater, the manufacturer produced a range of compatible trimmer blades that will trim the grass and weeds off your lawn more efficiently. Strong line: this weed eater uses dual polymer .095 inches line. However, if you have to deal with thicker grass, you can change this line with the stronger co-polymer available option. Semi-automatic trimmer head: designed to improve the user experience, this weed eater boasts a T25 semi-automatic head. The level of toxic fumes released by this weed eater is not CARB compliant. Designed for homeowners and semi-professionals, this weed eater is powered by a 22cc 4-stroke engine and boasts an excellent balance and a superior maneuverability. The 224L is lightweight and extremely easy to start, being a great tool even for the newbies. Boasting a 4-stroke engine, the 224L runs on pure gasoline. This means that you will no longer have to worry about the right oil/gas ratio. Don’t forget, however, that you will have to use a lubricant to ensure the smooth work of the tool. Commercial-grade line: although it is designed for occasional or seasonal use, the 224L uses .095 inches line, cutting efficiently through all types of grass and weeds. Quiet operation: for a gas-powered weed eater, the 224L is incredibly quiet. Easy to start: Husqvarna equipped this weed eater with the Smart Start technology, making it really easy to start. 4-stroke engine: this weed eater runs on gasoline alone, so it will be easier to refuel it. Because of the characteristics of the T35 trimmer head, the line seems to be hard to change. Designed for landowners and semi-professionals, the 223L is a reliable weed eater powered by a 24.5cc 2-stroke E-Tech engine. Easily maneuverable, this weed eater has an impressive balance and it is extremely lightweight, while the .095 professional-grade line cuts easily through all types of grass. Like the previous models reviewed, the 223L is also equipped with the Smart Start system and boasts the convenient air purge that is also designed to make the weed eater start easily. Wide cutting swath: the 223L boasts an 18-inch cutting swath, being suitable for the use even on the large lawns. Bump feed head: advancing the line is easy and simple, thanks to the convenient bump feed head. This feature will also avoid wasting precious line. Comes with pre-mixed fuel: when buying this weed eater you will also get three pre-mixed Husqvarna fuel cans. Some users complained about the weed eater not being very ergonomic. A versatile Husqvarna weed eater designed for professional use is the 324LDX. This tool is powered by a 25cc 4-stroke engine, being fueled by gasoline. This weed eater is lightweight and boasts an ergonomic construction, being suitable for prolonged use. This weed eater also features the Smart Start system and the straight shaft is detachable, to make it easier for you to attach the available accessories. However, it should be mentioned that this tool is compatible with a series of professional use accessories and not with the ones destined to residential use. Professional tool: this weed eater is designed to be used on all types of lawns and it uses the commercial-grade .105 inches line. 4-stroke engine: you will not have to worry about mixing the gas with oil, thanks to the convenient 4-stroke engine. Click-On attachments: switching from one tool to another is made easy by the Click-On attachments system. Detachable shaft: thanks to this feature, you will not only be able to change the attachments with ease, but also to transport and store the tool more easily. The 324LDX weed eater is really expensive. This cordless electric weed eater is lightweight and comfortable to use, boasting an excellent balance. Designed for occasional use, the 136LiL is powered by a 36-volt lithium-ion battery and is equipped with the intuitive keypad and the SAVE function. This weed eater also uses the strong commercial-grade .095 inches line, being suitable for all types of grass and weeds. With zero emissions and quiet operation, the 136LiL is a perfect weed eater if you have a small lawn or if you don’t plan to use this tool very often. Battery powered: this tool delivers the power of the gas-powered weed eaters in an environmentally-friendly manner. Adjustable front handle: for a comfortable use, you will be able to adjust the front handle according to your needs. Telescopic shaft: you will be able to maintain a healthy position while using this tool, thanks to the telescopic shaft. SAVE function: you will be able to choose between more power or more runtime with a simple touch of a button. The battery and the charger are not included in the purchase package, so you will have to sustain an additional cost. Even if all the Husqvarna weed eaters reviewed above represent excellent choices, I prefer the Husqvarna 128LD 28cc 2-Stroke Gas-Powered Straight-Shaft String Trimmer. This tool is extremely powerful and very versatile, being compatible with a wide range of accessories, including other tools and additional cutting attachments created to boost the cut efficiency. Another characteristic I like is the low weight and the handling ease, that are both exceptional for a gas-powered weed eater. All these characteristics, together with all the technologies used by Husqvarna for their gas-powered tools, make the 128LD the best Husqvarna weed eater on the market.